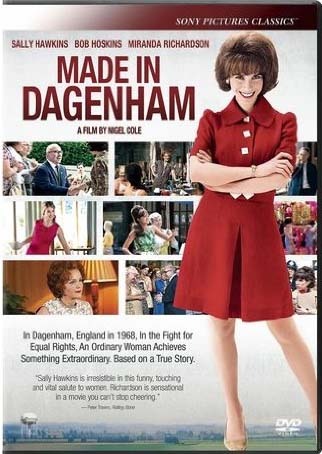 Directed by Nigel Cole ($5 A Day, Calendar Girls), the movie tells the real-life story of a 1968 strike conducted by a group of nearly 200 women sewing machinists employed at a Ford Motors plant in the London suburb of Dagenham. Hawkins portrays Rita O’Grady, a spirited wife, mother and factory worker who leads the ladies in their protest to earn the same pay (or close to it) as the plant’s thousands of male employees. And they win. 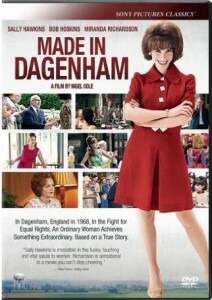 Disc Dish: What led you to Made in Dagenham? How did you first hear about it? Sally Hawkins: I got a lovely letter from [producer] Stephen Wooley and a very early draft of the script. I didn’t have to read much of the letter to know I wanted to do it, even though I didn’t know about these women — and not many people do from my generation. Stories like this one that exist in reality are so inspiring. I looked at the script and the part, and I knew it. I’ve been lucky to have opportunities to be approached for projects that are concerned with important issues. So I met with Stephen and [co-producer] Liz Karlsen and [director] Nigel Cole, and we made it. DD: You must receive a whole lot of scripts and letters from filmmakers who want to work with you! SH: Scripts just pile up. And there are only so many well-written scripts and projects in the world, so I’ve been lucky that many of them come my way. If there’s something about the script, that’s what I go for. Of course, you want to be good and you want to do the best you can, whether it’s for the lead or a smaller part. I’m taking the long view: It’s not about getting the big roles — it’s about the right roles. I think that’s the only thing that’s going to work for me. DD: What kind of research did you do for your role of Rita O’Grady, who’s actually an amalgam of women involved in the real Dagenham story? SH: I had a lot material to look at — the complete story — so I was very familiar with it. But then I had to let the whole thing go from one part of my brain, because my character didn’t know the whole complete story or how it ended; I let it go so that I could act it. I also met with three of the women from the time, which I wanted to do because that gives me a hook to work from. I went to Dagenham to meet them, and they were very kind to me. They all still lived in Dagenham and they were all still friends. I don’t know why that sort of surprised me, but it did. They talked about little details of the time, and they laughed a lot together, and that’s what really struck me: At the end of the day, they weren’t interested in becoming something other than what they were — they just wanted to get back to work and go home to their families. What I really got from them was that it was their great friendship that gave them the strength to do what they did. They were incredibly down to earth women; they weren’t particularly impressed that we were making a film about them, just as they weren’t all that impressed with the politicians they were meeting when it was all happening, the fat cats in suits. That’s how they held their own. They weren’t overwhelmed by the men they had to deal with. All that language that surrounds politics, they cut straight through that and just spoke honestly. DD: Rita’s quite a remarkable woman, wrapped in a very ordinary, practical skin. Sally Hawkins makes magic on her vintage Bernina in Made in Dagenham. SH: Yes, she’s very straight-on, and she just deals with what she has to deal with at the moment. Thrown into the Dagenham situation, it hits her hard, and she has to learn it very fast. She sort of unearths this intelligence and ability that’s inside of her. She’s learning, just like all the other women are learning. That was the most important part for me, that Rita found her voice, her own voice. DD: What did the women of Dagenham think of the film? SH: They were delighted! I know there were several early screenings here and in Rome that a number of them attended, and they were simply delighted! What’s really lovely is that their small story, which had a global impact at the time, is being told today. Our film was representing real women, and that’s a real responsibility and a privilege. I guess that’s a lot to take on, but I’m not really interested in work that doesn’t push at something. Here’s a great story of smart, passionate and intelligent women who brought about real change. And you just hope that you’ve done them justice. DD: Made in Dagenham immediately calls to mind Norma Rae, another great movie about a woman who brings about change in the factory workplace. Had you seen Norma Rae or spoken to star Sally Field before making the film? SH: (laughs) A friend of mine, after reading the script, asked me if I had seen Norma Rae, which I hadn’t seen. And I didn’t want to, even though I love Sally Field. I didn’t watch it until recently, after all the production. It was very moving. DD: You were like “Little Sally” in Dagenham! SH: I should have gotten up on a little table and protested! DD: On the most practical level, did you learn how to sew for the film? SH: I did! I wasn’t very good, but I wanted to learn and I did. For the movie, I got a beautiful old Bernina sewing machine, which I still have. I was just learning how to dart a very basic skirt when the production finished, and I still need to do the hem. Lovely interview – lovely person… I had the book “Working For Ford” by Huw Beynon as a textbook for my university studies. Dagenham was not an easy place for either management, white collar staff or blue collar workers back at that time. The achievements of the Dagenham ladies is all the more special when you look at that tumultuous period. Congrats to Sally Hawkins for helping to keep that victory for commonsense fresh. Absolutely agree on the congrats to Sally Hawkins PabloGC. Glad you enjoyed the interview.